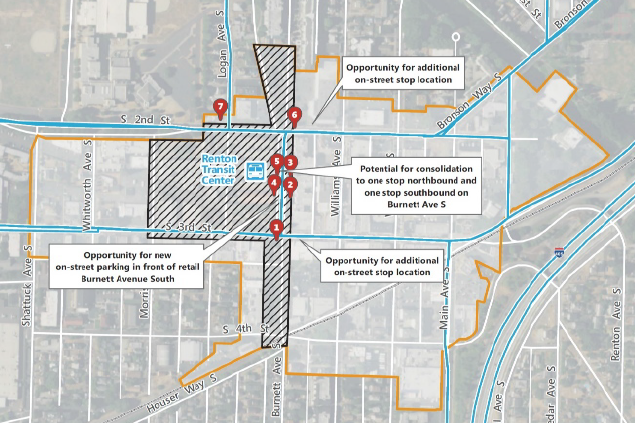 Potential revisions to downtown Renton transit operations (Map: City of Renton). The ST3 program included, at the suggestion of the City of Renton, a new transit center with a 700 stall park-and-ride in South Renton near the intersection of I-405 and SR 167. Relocating the downtown transit center, however, left observers questioning how much transit would serve downtown in future. Mayor Denis Law, among others, viewed a relocated center as a positive step for downtown. The downtown transit center, in the view of the city, was not compatible with plans for a pedestrian-oriented downtown. There were issues with crime, and drivers to the parking garage added to downtown congestion. The city intends to restore two-way traffic on South Third and South Second streets, revitalizing them as neighborhood streets rather than commuter routes. Planning to improve Renton’s downtown has moved forward. With it has come a more worked-out view of future transit service. Renton now intends to maintain a downtown transit center, but with several operational modifications to reduce supposed impacts to downtown. Twelve routes serve the downtown transit center with 3,500 daily boardings. Eight of those routes layover there. Many riders transfer, particularly from ST 566 and RapidRide F to local routes. All routes should continue to serve the downtown transit center. Some routes will be extended so they do not terminate in downtown and continue to South Renton. The primary transit route would be Burnett Ave S. Some other stops would be moved to S 2nd St and S 3rd St. Stops would be removed from the access road between Logan and Burnett Avenue and from Logan Ave S. That means moving many of the stops around the transit center, though mostly within a block or so. The access road between Logan and Burnett Avenue would be closed to buses and become a “heart” block surrounded with active uses. Layover spaces are likely to move to on-street spaces several blocks west of downtown (and away from downtown storefronts). Other buses could layover on streets adjacent to the Metro P&R in South Renton. With the removal of bus layovers, the footprint of downtown transit operations could be reduced from the current ten bays to five or six. Parking for transit users at the City Center garage, where Metro currently leases 150 parking stalls, would remain. Route 101 would be revised to terminate in South Renton, and serve downtown on its path between Seattle and South Renton. The existing park-and-ride in South Renton, operated by Metro, serves just 1,000 riders a day, but could see more service as downtown routes are extended, and much more service as I-405 BRT begins serving Sound Transit’s new South Renton TC in 2024. 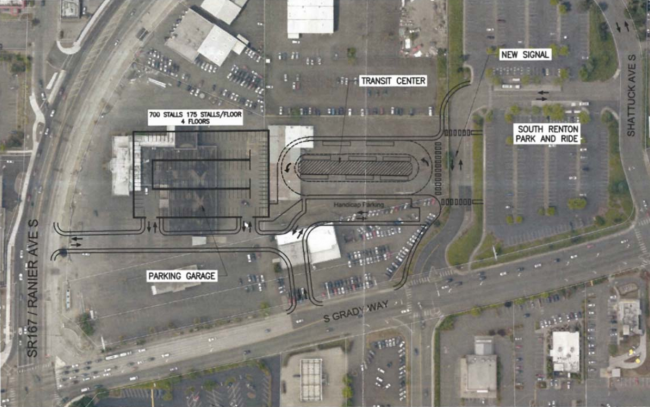 Sound Transit’s planned transit center in South Renton (Image: City of Renton). These proposals are expected to add operational costs for transit operators. Layovers west of downtown mean 6,000 – 8,000 additional deadhead service hours per year (~$1 million). Layovers in more distant South Renton could add 15,000 – 20,000 service hours per year (~$3 million). Removal of layover space from the transit center could begin within 1-2 years, with stop restructuring a year later. It’s welcome that Renton leaders are reconciling their downtown revitalization plans with transit. Nevertheless, the thinking remains that the presence of buses in downtown are an impact to be mitigated, even at significant cost to operators. I never liked that transit center. It was always completely disfunctional. The routing was unnecessarily circuitous, and the garage offered minimal meaningful parking (better arrive early!). What was worse was that the area didn’t really offer much of anything in the way of a destination. A coffee shop that closed early and a cupcake shop? Oh, there was the bank and the Indian restaurant, two things worthwhile, but that was about it. Beyond the transit center, buses traveled along slow city streets with lots of stoplights for several miles before continuing on as true “express routes” on I-405, SR 900, or SR 167. All that being said, why on Earth did nobody see these faults early on when it was originally built? It is frustrating to see us build all of this specialized infrastructure, keep it in service for a few years, and then throw it away after we realize our short sightedness. How exactly will a 405 express both get to South Renton without getting bogged down in traffic for ten minutes? If they can’t solve that and I was king of ST, I’d skip Renton entirely. Agreed that having a park-and-ride that doesn’t directly connect to 405 seems really punishing for users. It also doesn’t help that the initial plan for bus access to the South Renton Transit Center is off of a side street. It’s not directly off of Rainier Ave, Shattuck Ave or Grady Way! How many times must a bus turn to get in and out of this “backyard” transit center? I count anywhere from 7 to 9. My stomach is woozy from the thought of riding through this maze of a path for buses into and out of this transit center. My understanding is the station is on the freeway, but I don’t understand how they’ll bridge the gap. It’s basically the whole block that Uwajimaya and Applebee’s are on. Getting from 405 to the South Renton P & R shouldn’t be difficult. There’s a southbound exit (2B) that delivers buses right to the Rainier & Grady intersection and the northbound trip isn’t much more complicated. The 566 could be split into 2 new routes: 1) a Kent to Bellevue via the SR P&R route that skips the long commute across Renton and would shave ~10 minutes off the Kent to Bellevue trip time and 2) a route that starts at SR P&R and serves the downtown TC and The Landing on the way to Bellevue. Last I heard, Exit 2B is scheduled to be closed, due to all the traffic backing up trying to make quick lane changes to reach westbound Grady Way. They’ve already opened the alternative: Exit 3, going through four red lights before reaching the transit center. Yay! 405 BRT buses should be using the HOV lane and not having to cross over multiple lanes to serve this park-and-ride. They’ve merely consolidated exits 2A and 2B. Drivers can still access rainier from that exit by staying right. This change has already happened. By the time ST starts using this the exits will be more defined as the related construction project comes to a halt. Engineer, what year was present Renton transit center built? A lot of what’s ascribed to stupidity is really result of changes accelerating beyond imagination. Four years ago when I moved to Olympia, Intercity Transit leaving town at 6:10 am could keep a northbound schedule to Tacoma. Now If I’m not across the Nisqually in my car by five, I’m stuck in a mile of traffic from the river to Dupont. Where I can get onto a two lane route that takes me about forty minutes extra to Tacoma. But at least, while I hardly ever use it, my “ride” has a horn, not a cowbell. In 2013, no reason to think I wouldn’t finish my life in Ballard. Now, can’t say that about any exit north of southern Tijuana. And Donde, whatever the mayor and some other people deserve, transit passengers don’t. An elevated ramp through a station same height with one stop at the transit center could be the solution that saves both passengers and Renton. What’s LINK’s planned route through Renton? The City of Renton should call it what it really is… That elected officials and businesses do not want transit riders on their bleached white streets waiting to catch their bus. Smells like racism to me. Renton is the last place that can complain about minority visitors with a straight face. When working-class people first started being priced out of multicultural south Seattle in the 1990s, they moved to Renton, Tukwila, Skyway, and Kent. Renton is heavily multicultural now. I frequently work in Renton. It’s always been a working class suburb and it still is today. It also is very diverse culturally and economically. Something that is frequently overlooked about Renton is that it doesn’t function just as a suburb of downtown Seattle. It’s also closely connected with Bellevue and the Kent/ Auburn area. Renton needs good transit service to places other than downtown Seattle. I live in Renton and work in Kent. For me the Renton transit center as it stands is not functional. It doesn’t play into my daily commute at all and at most may visit there two times a month. It’s always jam city during rush hour. Not the place you want your bus when you’re trying to get home. Sounds good! Except “heart block” — it’s a small point, but couldn’t they come up with a better name?? It conjures up heart attack, blood clot, stroke, arrhythmia, for me. Pedestrian zone? Central Plaza? I see this as a big win (with my limited knowledge of the proposal). Some forces within Renton City Hall wanted transit banished to the periphery, possible for classist/racist reasons. But when City staffers looked at how to actually do that, they found out it wasn’t feasible. Due to geography and demand, most local bus routes have to travel through downtown Renton. No more looping offstreet through a transit center – all bus stops at curbs of through streets. Layovers away from the heart of downtown. May cost Metro a bit in deadheading but is friendly to Metro’s customers. Route 101 travels to downtown Renton first, then the South Renton transfer center, reducing travel time between Seattle and downtown Renton. Another reason to stop calling it I-405 “BRT.” A light rail would not get bogged down in making all those turns to get to the station. Nobody would build a light rail that way! “Light rail on wheels,” this is not. It does take buses a long time to go through central Renton, and that does nobody any good. I’m not sure how many options there are given that downtown Renton is buried in the middle of a car-and-highway sewer. I didn’t like Renton’s dismissive language of buses, but with good routes that connect Rainier Beach station to the eastern and southern residential neighborhoods, bus circulation may become better. And the issue about the “transit center” may be one of terminology. I think of a transit center as something ideally downtown where you can both transfer between several routes and walk to destinations. But some people think of transit centers as places with large P&Rs. Obviously the two are incompatible. I don’t mind Renton moving the highway buses to the South Renton P&R as long as something serves downtown well, and who cares which one is called the “transit center”. The mayor seems to emphasize the negative externalites of transit and not its benefits. The main objective of transit is to extend the range of pedestrians; there are pedestrians in downtown Renton an it has a nice tight street grid developed before WWII. The area near the South Renton Park-and-Ride is a sea of asphalt with few pedestrians. Auto access riders are a small segment of the market. I-405 is a huge freeway; freeways are to pedestrians as dams are to fish. Sure, the couplet could or should be converted to two-way arterials (see Redmond), but transit should have in-lane stops. Perhaps bike lanes could be placed on the arterial without transit. Both routes 101 and 169 will have improved frequency in March? Route 106 was improved in September 2016. The F Line is doing well. South Sounder is as well. Are they still planning on adding the direct access ramps to South Renton for the 405 BRT? I sort of remember that the idea of the current Renton Transit Center was conceived back in the days when the Dinner Train to Woodinville was still operating, as a good way to cluster transit in the area, with apartments having easy access to transit, no car necessary, etc. A large special waiting hall was built for the Dinner Train passengers. Then the Dinner Train became history…. How soon can Metro revise the 101 to begin and end at the current South Renton P&R? That change needs to happen yesterday. I don’t know that but in March Metro will reassign eight peak 101 runs to the 102. That may be in preparation for it.